From Curmudgeonly & Skeptical -- Your go-to source for demented insanity that somehow makes sense. That car is us,thanks to the dipshits behind the wheel- uh vote. That truck must be a F.O.R.D. I made my hotel reservations for the Florida Keys today, and really must remember to put the drain plugs in the boat. Wonder if that Obama supporter is finished with that one, and that One? No, twolaneflash, it's a GM pickup. Around here (north central Texas) they're not in any way an endangered species, although Fords are slowly becoming more popular. BTW were you aware that you were propagating a UAW propaganda campaign left over from the 1930s? The blue oval is clearly visible under the tongue of the trailer. Fooled by the tail lights, I was. 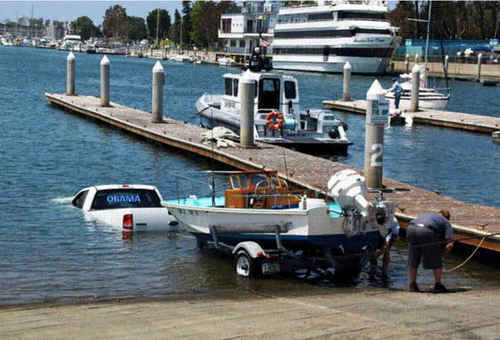 Just one more pull, and the ObamaCare boat will be afloat!! Sherlock wins the caption contest.